On our last day in Singapore this year while staying at Elaine & Tom’s lovely Mandarin Gardens home, we were walking along East Coast Road and stumbled upon Xin Wang. It looked like a cute and funky café, so we popped in for a bite to eat. 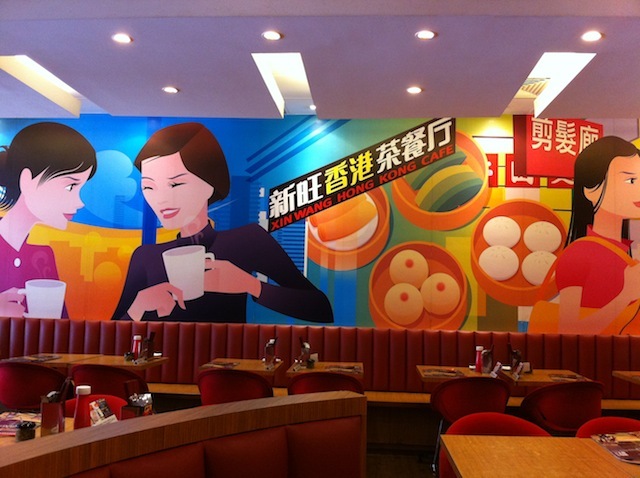 Xin Wang Hong Kong Café is, as you would expect from its name, a chain of HK-style cafés in Singapore and Malaysia. In addition to regular HK fare, they also offer delights from Macau, Shanghai and Singapore. Compared to hawker food in Singapore, prices at Xin Wang are approximately double the price, around $6 SGD per dish. However, still relatively affordable fare. And the best part is that the restaurant is open late – 3am on Friday & Saturday nights (2am every other evening)! 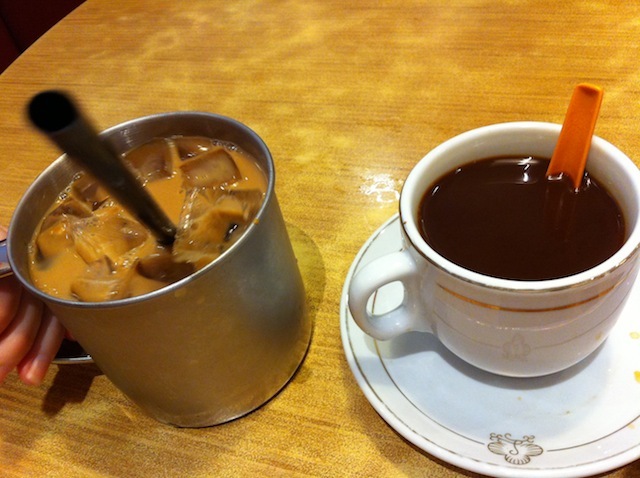 No trip to a HK-style café would be complete without sipping one of my favourite beverages: Dong Yinyong – A delightfully sweet mixture of Hong Kong-style milk tea and coffee, served ice-cold and extra creamy with evaporated milk. My drink was served in a tin mug, which was unique. I’m actually drinking a yinyong concoction as I write this post. I used mixture of black tea, Nescafe instant coffee, fresh cream, and sugar. Although tasty, it’s just not the same! 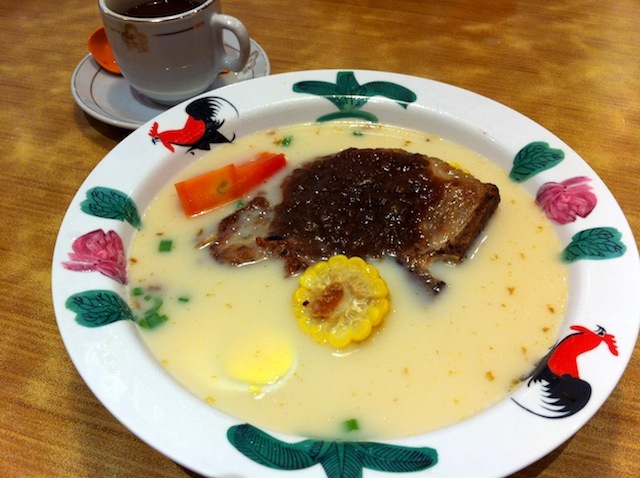 Pork Chop Noodles in Papaya Soup – A creamy broth, including corn on the cob and a hard boiled egg. 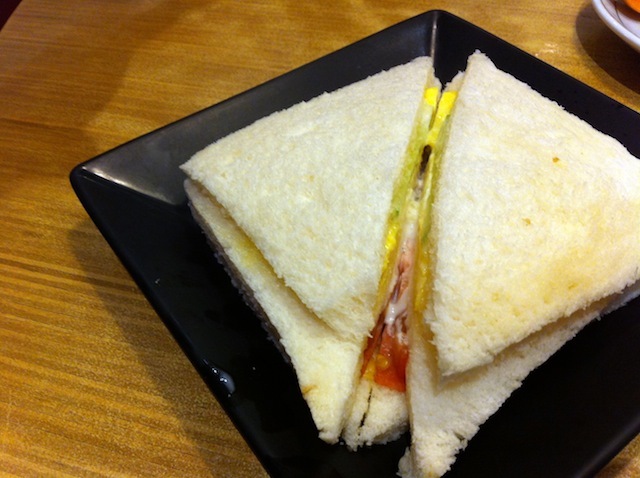 Ham & Egg Sandwich with tomatoes and cucumbers, white bread with crusts cut off. The sandwich was served pipping hot, as if it had been in the microwave far too long. Compared to the delicious Hong Kong-style cafes in Vancouver and HK itself, Xin Wang came pretty close, but not exactly the same. 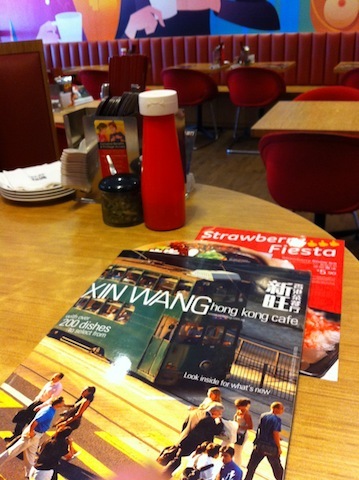 If you live Singapore and are craving HK fare, then you’ll most likely be satisfied with Xin Wang’s offerings.